Ten years. It has been ten years since Themata was released. 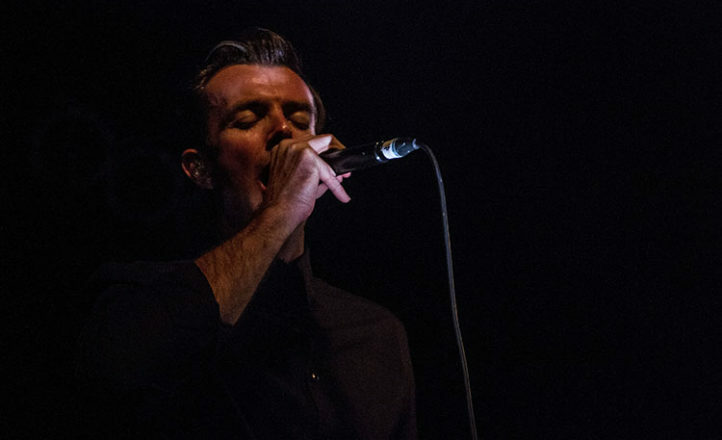 I caught Karnivool on that album tour, and in the ten years since, dozens more times. The Uni Bar was already teeming with people when tour companions and only support for the first show of the tour, Cairo Knife Fight took the stage. The two piece exploded with dirty riffs and brash drums, the New Zealand duo eager to assault all ears in attendance. While a few keen punters on the barrier showed the band their dues, most hung back, making trips to the bar, nodding their heads in approval. The Kiwis gave the ‘Gong’ a solid pounding, looped riffs and cacophony of drums and crashes, but the crowd were here for one band only. A lot can change in ten years, especially in the musical world, influences and music tastes change, bands come and go, but for Karnivool, a five piece from Perth, who have garnered a cult following through constant touring and incredible album releases, they have only grown stronger. Opening with “COTE”, the crowd launched into a seething, jumping mass, the security weren’t ready for punters surfing over the barrier, with more than one person taking a heavy fall. Front man Ian Kenny moves like a snake, graceful and deliberate, looking straight with a non-blinking stare. Title track “Themata” and “Shutterspeed” kept the energy flowing, the entire crowd screaming along in unison. Taking a moment, Kenny reminisced about the past, commenting on a poster on the wall from their 2006 Synopsis tour. “L1FEL1KE” created an immense wall of sound, and the instrumental “Scarabs” confused, compounded and crushed all, bassist Jon Stockman an absolute beast on stage. Karnivool slowed the set down a bit in “Sewn and Silent” and “Mauseum”, before stopping completely for “Omitted For Clarity” — twenty seconds of silence. The first half closed on “Change Pt 1”. They shortly returned to play a selection of newer cuts, “Simple Boy”, “Goliath” and the meandering “We Are” with its haunting refrain fading out. As this was the first show of the tour, Wollongong audiences were treated to the first airing of new track “Aozora”, a slower, mesmerising number that will grow with every listen. Closing out the night, the five piece couldn’t thank the crowd enough, ending it all with “New Day”, the audience drowning out Kenny’s voice.